"Comes in bison and red meat flavor and contains no by-products or fillers." "Each pack of six tubs comes with three flavors, including lamb, beef, and chicken. The food contains no corn, wheat, or soy." "The small kibble bites are easy to chew and easy to digest for dogs both big and small." "Includes a complex blend of antioxidants, calcium, omega fatty acids, and glucosamine to keep your dog’s skin, bones, and teeth healthy." "Each of the six different flavors is produced with only a few ingredients, so you can be sure to avoid additives that upset your pup." "The dry food is made up of 27 percent protein, 4 percent fiber, 10 percent moisture, and only 12 percent fat." "Added calcium, omega-6 fatty acids, and antioxidants work to keep your small dog’s skin, coat, and bones healthy." Blue Wilderness’ dog foods offer a high-protein, grain-free diet that is great for nearly all canines. Their adult version comes in bison and red meat flavor and contains no by-products or fillers. 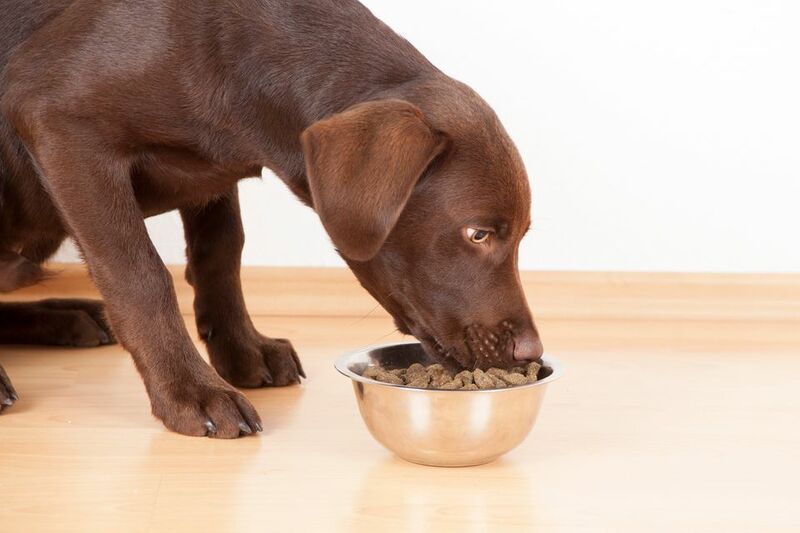 Though some dogs can digest whole-grain carbohydrates well, many canines experience food sensitivities and weight gain with grain-filled foods. Blue Wilderness is made up of 30 percent protein, 15 percent fat, and 6 percent fiber. It also contains the company’s “LifeSource Bits,” a blend of vitamins, minerals, and antioxidants to help keep your dog in tip-top health. The added omega-3 and omega-6 fatty acids keep your dog’s coat and skin healthy and flake-free, while the extra calcium works to protect both growing and aging bones. If you’re looking for an all-around great dry food that fits the nutritional needs of most dogs, Blue Wilderness Rocky Mountain Recipe Adult Dry Dog Food is an excellent choice. Wet food often has fewer carbohydrates, more protein, and fewer (or no) synthetic preservatives. If you’re hunting for a quality wet food, Rachael Ray Nutrish Natural Wet Dog Food is a great, affordable choice for your dog. Each pack of six tubs comes with three flavors, including lamb, beef, and chicken. The food contains no corn, wheat, or soy. Each version has 9 percent protein, 5 percent fat, and 78 percent moisture, so it’s a great choice for dogs who struggle with dehydration or water intake. Wet food is also a good alternative to dry food for picky eaters or dogs with limited appetites. It often has a more appealing scent that most dogs simply cannot resist. Reviewers say their picky dogs love Rachael Ray Nutrish Food. Some remark that it works well alone or as a tasty mix-in with dry food for added flavor. For a dog food, Taste of the Wild has a pretty avid fan base. We picked Taste of the Wild High Prairie Puppy Recipe with venison and bison as the best choice for your family’s new addition for many reasons. It’s free of grain, corn, wheat, filler, artificial flavors, colors, and preservatives, while still giving your puppy the nutrients he needs. The first ingredient is real buffalo, and each serving has 28 percent protein, 17 percent fat, 10 percent moisture, and 5 percent fiber. Taste of the Wild also has added vitamins and antioxidants to help support a healthy skin and coat and aid in digestion. Moreover, the small kibble bites make it easy to chew and digest for dogs both big and small. As your dog ages, he requires different nutrients to keep him healthy and address common senior health concerns. Blue Buffalo BLUE Life Protection Formula with chicken and brown rice is formulated with your older pup in mind. At what age should you switch to a senior formula? Generally, a large breed dog is considered a senior at 7 or 8, while a smaller breed hits the golden years at 10 to 12. The new food will provide a balanced diet to keep him healthy throughout his twilight years. Made with no-filler chicken, BLUE has no corn, wheat, or soy products. It has just 18 percent protein because senior dogs with kidney issues should have less protein as they age. The food also contains 10 percent fat, 7 percent fiber, and 10 percent moisture. It includes a complex blend of antioxidants, calcium, omega fatty acids, and glucosamine to keep your dog’s skin, bones, and teeth healthy. Dog owners turn to BLUE because it offers a filler-free, nutrient-rich option at a fair price. Owners say their older pups love this food, even those suffering from health issues. If your dog suffers from allergies, it can be difficult (and frustrating) to pinpoint exactly what causes his flare-ups. A limited ingredient dog food can be a great choice for any pup suffering from allergies or food intolerance, and we love Wellness Simple Natural Limited Ingredient Dry Dog Food. Each of the six different flavors is produced with only a few ingredients, so you can be sure to avoid additives that upset your pup. Wellness Simple is made up of 21 percent protein, 11 percent fat, 4.75 percent fiber, and 11 percent moisture. By providing your dog only a single source of protein, you can pick one that your dog can digest without issues, whether that be duck, lamb, turkey, or salmon. From hot spots to digestion issues, owners say Wellness Simple is a great way to help eliminate issues caused by food allergies. Some note the small kibble size, which could be an issue for very large breeds. Overall, though, Wellness Simple is a great choice for any dog who suffers from allergies. Labradors, like most large breed dogs, need extra protein to stay healthy and energized. Nature's Recipe Large Breed Grain-Free Dry Dog Food provides exactly what these active dogs require. The dry food is made up of 27 percent protein, 4 percent fiber, 10 percent moisture, and only 12 percent fat because every lab owner knows just how easy it is for this breed to put on the pounds. The all-natural chicken helps support lean muscles, and the healthy carbohydrate ingredients (such as sweet potatoes and pumpkin) help maintain a strong digestive system. Since many labradors suffer from very sensitive stomachs, this is especially important. Dog owners love Nature's Recipe because it’s formulated just for large dogs. Many reviewers note that it works well for dogs with food sensitivities, as well as those with large appetites. Hill’s Science Diet Small & Toy Breed Dog Food is made specifically for dogs under 25 pounds. It is created with the right balance of nutrients to keep small dogs healthy. The small-sized kibble is perfect for these dogs, and the nutritional analysis consists of 21.5 percent protein, 12.5 percent fat, 4 percent fiber, and 0.65 percent calcium. There are no artificial colors, flavors, or preservatives. The added calcium, omega-6 fatty acids, and antioxidants work to keep your small dog’s skin, coat, and bones healthy. Reviewers say this Hill's Science Diet food is a great choice for maintaining their small pup’s weight. They also remark that their pets seem more vibrant and full of energy on this food.